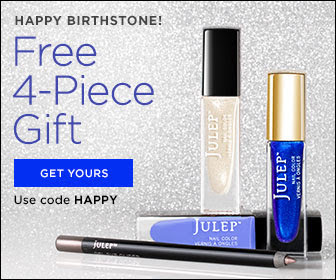 It's my birthday month, and to celebrate I'm giving my readers a special gift--a free beauty box inspired by my birthstone, the sapphire, when you join Julep Mavens! You'll get the gorgeous nail color trio pictured, plus a Gel Eye Glider, all full-size, naturally. And of course your subscription to Julep Mavens means you'll get a box full of beauty goodies every month (choose the curated box or swap out a product or change a color). All you have to do is click the link below and enter code HAPPY. Happy because it's my birthday month (happy birthday, fellow Virgos! ), happy because you're getting my September birthstone box for free when you join Julep Mavens, and happy because happy girls are the prettiest! Join Maven and get the September Birthstone Welcome Box FREE ($58 value) - just pay $2.99 shipping!